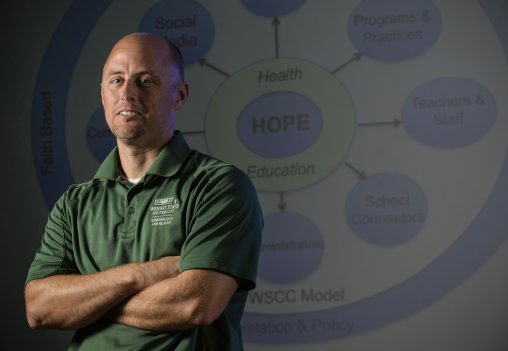 Kevin Lorson, director of Wright State University’s Physical Education Licensure Program, created the Health and Opioid Prevention Education (HOPE) curriculum. Kevin Lorson, professor and director of Wright State University’s Physical Education Licensure Program, will be honored with a Chancellor’s Award for helping create a statewide opioid prevention curriculum for Ohio schoolchildren. The award will be presented to Lorson at Wright State on April 17 by John Carey, chancellor of the Ohio Department of Higher Education. The presentation will take place at 11 a.m. in the Student Union Wright Brothers Room. The Chancellor’s Award recognizes exemplary students, faculty and administrators who have gone above and beyond the call of duty in using the power of higher education to impact their campus, their community and for the greater good of all of Ohio. Only one Chancellor’s Award is given out per semester statewide. Lorson received an award from the Ohio Department of Higher Education to organize a statewide team of health educators, administrators and higher education faculty to develop the Health and Opioid Prevention Education (HOPE) curriculum. It is designed to help schools address state requirements and be adaptable to the needs of each school district in Ohio. Lorson said he is grateful for the award and humbled by it. Also working on the project were Judy Jagger-Mescher, director of the Health Education Licensure Program; Mary Huber, associate professor of human services; and Tracey Kramer, director of the Office of Partnerships and Field Experience. The curriculum is a series of lessons aimed at helping students develop the knowledge and skills to make healthy choices with opioids and prescription medicine. The curriculum is being used in health education classes to teach important concepts and skills to prevent opioid and other drug use, including taking medicine only under the direction of a trusted adult, not sharing or taking someone else’s medicine, avoiding driving under the influence or riding in a vehicle with someone under the influence, using refusal and assertive communication skills and supporting others in making healthy choices. In addition, teachers, school personnel, administrators and families are encouraged to provide consistent messages about healthy decisions and reinforce the importance of using medicines appropriately. “While the HOPE Curriculum lessons are an important element in drug prevention, it will take the curriculum and a comprehensive or whole-school approach that includes support from the community to help students to make healthy, drug-free choices,” Lorson said. Lorson, who teaches in the College of Education and Human Services, is a member of the Ohio Joint Study Committee on Drug Abuse Prevention Education with Ohio Attorney General Mike DeWine. The committee is responsible for developing recommendations in policy, legislation and programs to prevent drug abuse by students.